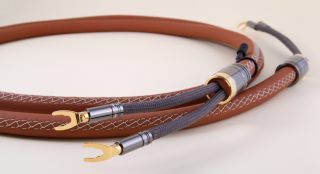 Atlas introduces flagship Luxe cables with leather finish | What Hi-Fi? Cables are often seen as unnecessary clutter – something to hide away in a rack or behind a piece of furniture. But if you’ve spent three or four figures on cables, you may want to show them off. Atlas’s new flagship speaker cable, the Asimi Grun, introduces the company’s new ‘Luxe’ finishing. It’s essentially a hand-stitched Nappa leather finish in a choice of four colours – ebony, brogue, ivory and red – either with a cross or baseball stitch detail. It's joined by Asimi Ultra and Asimi XLR analogue interconnects, which also feature the 'Luxe' finish as standard. The Asimi Grun Luxe is made up of six OCC (Ohno Continuous Casting) solid silver conductors, covered by what Atlas claims is the most complex dielectric material it has ever produced. It also uses the 'grun' grounding solution introduced last summer in its Mavros and Ascent lines. That means, unlike RCA cables, it provides an 'independent' earth and connects straight to the ground, helping to eliminate radio frequency and electro magnetic interference. The Asimi Grun Luxe is terminated with Atlas’ Transpose silver-plated plugs, designed to allow the owner to easily switch between 4mm connectors, spade and Z-plugs. The Luxe finish is also available as a £225-per-metre upgrade on other Atlas cables, including the Mavros Grun and Ascent Grun speaker cables, the Mavros Ultra, Mavros XLR, Ascent Ultra and Ascent XLR interconnects, and the Eos superior power cable. The Asimi Grun Luxe is available in three configurations – Asimi Luxe 2-2, Asimi Luxe 2-4 and Asimi Luxe 4-4 – with prices starting from £6600 for one metre. A 1.5m length costs £9400, a 2m £12,200, while a 2.5m length costs £15,000 and 3m £17,800.